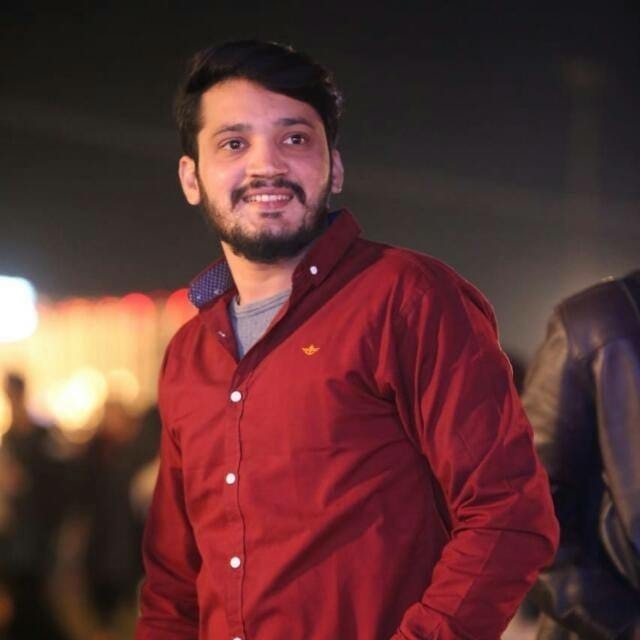 Freedom Network is extremely worried for two missing young journalists – reporter Matloob Hussain Mosavi and TV cameraman Syed Ali Mubashir Naqvi – who were taken away in what appears cases of enforced disappearances in Karachi and registration of case against investigative journalist Shahzaib Jilani for his investigative reports and a tweet in which he expressed himself. “It has been over two weeks that the two journalists were taken away and there have been no words about their whereabouts since then. It must be an extremely worrying situation for the families, but also for us,” Freedom Network said in Press Freedom Alert on 14 April 2019. The journalists’ disappearances – one from his residence and other from a road in broad daylight in Karachi where security is said to have improved – is a new manifestation of threats journalists are facing. “No other than the Sindh government is responsible for the two journalists’ disappearances and Freedom Network urges Chief Minister Murad Ali Shah to personally take into this serious case,” the Press Freedom Alert said. 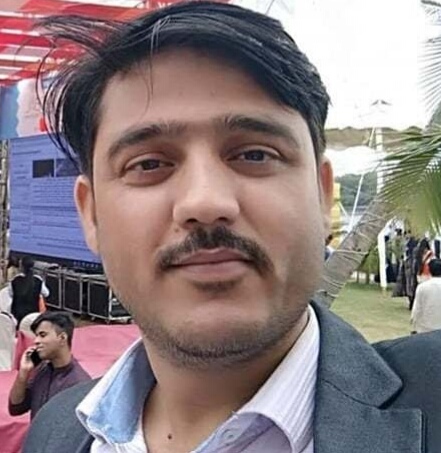 Matloob Hussain Mosavi, 27, who works for Urdu-language Jang newspaper, was abducted in wee hours of 30 March 2019 by a group of men who arrived in umarked vans, accompanied by three police vans. The way he was taken away suggested if he was a terrorist although he was not, the worried brother said. He believed Matloob might have been disappeared for his social media comments. 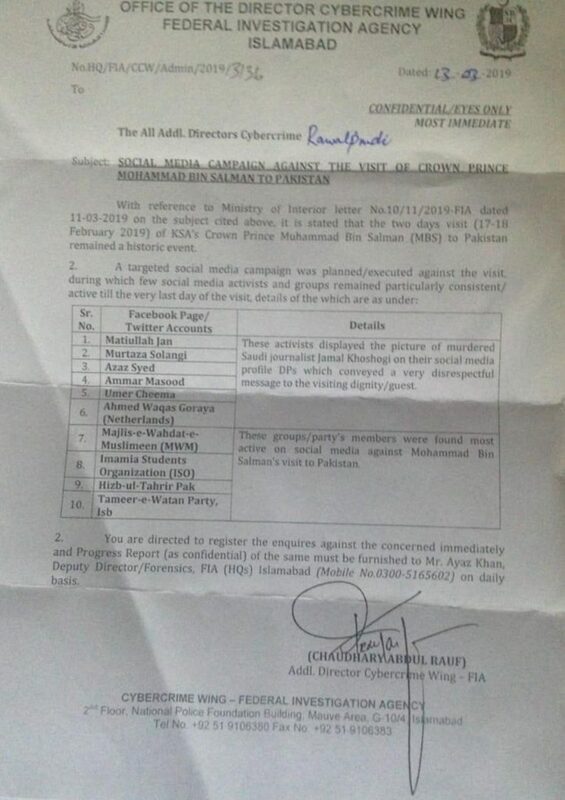 A leaked letter of Federal Investigation Agency (FIA) said “a targeted campaign” was launched to undermine the visit of Saudi crown prince Muhammad bin Salman early this year and named quite a few senior journalists and some Shia organizations to be probed. Aab Takk News TV cameraman Syed Ali Mubashir Naqvi was the second journalist to face abduction. He was taken away from the TV channel’s parking lot in Karachi on the evening of 1 April. Disturbingly, both the missing journalists are member of the Shia minority. “The two disappearance cases look designed to intimidate the journalists,” Freedom Network said in its Press Freedom Alert. Shahzaib Jilani, senior journalist working for Dunya News TV channel secured interim bail from the Sindh High Court to escape arrest by the Federal Investigation Agency which registered a case against the journalist under Prevention of Electronic Crimes Act 2016. “If FIA continues to register FIR on any complaint against any journalist at such a pace Pakistan may become no-go area for journalism as Jilani is booked for his professional duty and personal opinion,” Freedom Network warned in its Press Freedom Alert. “I believe this tweet and my story on missing persons may be the reason behind this case which surprised me,” Jilani told Freedom Network. Increasing use of PECA laws against journalists undermines foundation of Press Freedom in Pakistan. Pakistan is ranked 139th out of 180 countries in RSF’s 2018 World Press Freedom Index.